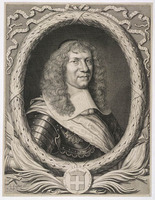 JUCHEREAU DE SAINT-DENIS, NICOLAS, seigneur, colonizer, business man, member of the council of the colony for the fur trade, director of the Tadoussac trade, soldier; b. c. 1627 perhaps at La Lande-sur-Eure (France), son of Jean Juchereau de Maur and Marie Langlois; buried 5 Oct. 1692 at Beauport. 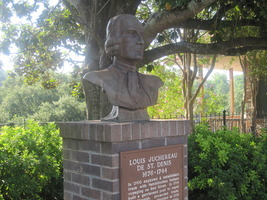 Nicolas Juchereau came to Canada in 1634 with his father, who was a person of some means. His uncle, Noël Juchereau Des Chatelets, had come to Canada probably two years earlier, to attend to the interests of the Compagnie des Cent-Associés, and later became the head clerk of the Communauté des Habitants. Nicolas Juchereau possessed vast domains. He obtained by grant, gift, or purchase, properties at Quebec, Beauport, and the Île d’Orléans. In 1656 he obtained as a grant the seigneury of Grande Anse (Saint-Roch-des-Aulnaies), comprising islands and shore-lines, where there was little or no farming. In 1673 the Giffards granted him the fief of Duchesnay, comprising a frontage of nine arpents and extending to the whole depth of the seigneury of Beauport: Juchereau saw to its being peopled and worked. For his son Joseph, who was six, he obtained from Governor Buade de Frontenac the seigneury of Saint-Denis in 1679. Although he is sometimes called seigneur of Beauport, Nicolas Juchereau never possessed this seigneury. 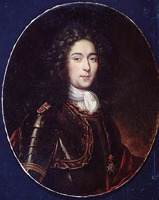 It was his son, Ignace Juchereau* Duchesnay, who received it as a gift on 17 Feb. 1683 and took possession of it in 1696. 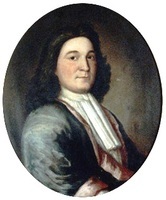 In 1679 Juchereau took into his home his brother-in-law, Charles Legardeur de Tilly, a member of the Conseil Souverain who had been exiled from Quebec by Frontenac. In 1684 he was among the 18 notables whom the intendant consulted about the country’s finances. In the same year Denis Riverin*, agent of the tax farmers for the fur trade, challenged his right to fish, hunt, and trade on his fief of Saint-Denis; these “privileges,” which had been “overlooked” in 1679 when the fief had been granted, were to be granted officially to Juchereau’s wife in 1697. He also distinguished himself as a soldier. 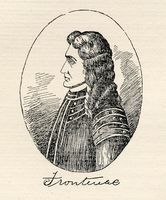 In 1666, at the head of a militia company, he took part in the expeditions led by Governor Rémy de Courcelle and by the Marquis Prouville de Tracy against the Iroquois. Subsequently he was to remain in command of this company. 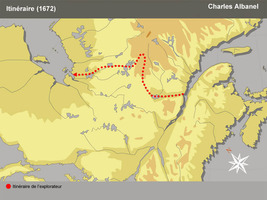 When Phips attacked Quebec in 1690, Nicolas Juchereau was stationed with his 80 or so militiamen at the place where the English troops landed, with the mission of harassing them and of blocking their path. He had an arm broken by a shot while he was trying to repel the invaders. 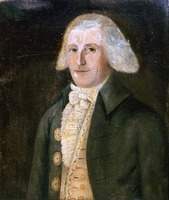 As the militia troops of Beauport and Beaupré had captured six enemy cannon, he received one as a trophy. In February 1692 he was ennobled as a reward for his services as a colonizer and soldier. He was buried in the cemetery of Beauport on 5 Oct. 1692. 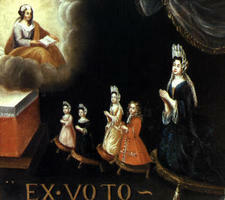 On 22 Sept. 1649 he had married, at Quebec, Marie Giffard, who bore him 12 children. His wife died in 1714. Bibliothèque et Arch. Nationales du Québec, Centre d’arch. de Québec, CE301-S1, 22 sept. 1649, 5 oct. 1692; ZE25-P40. Bernard Weilbrenner, “JUCHEREAU DE SAINT-DENIS, NICOLAS,” in Dictionary of Canadian Biography, vol. 1, University of Toronto/Université Laval, 2003–, accessed April 24, 2019, http://www.biographi.ca/en/bio/juchereau_de_saint_denis_nicolas_1E.html.